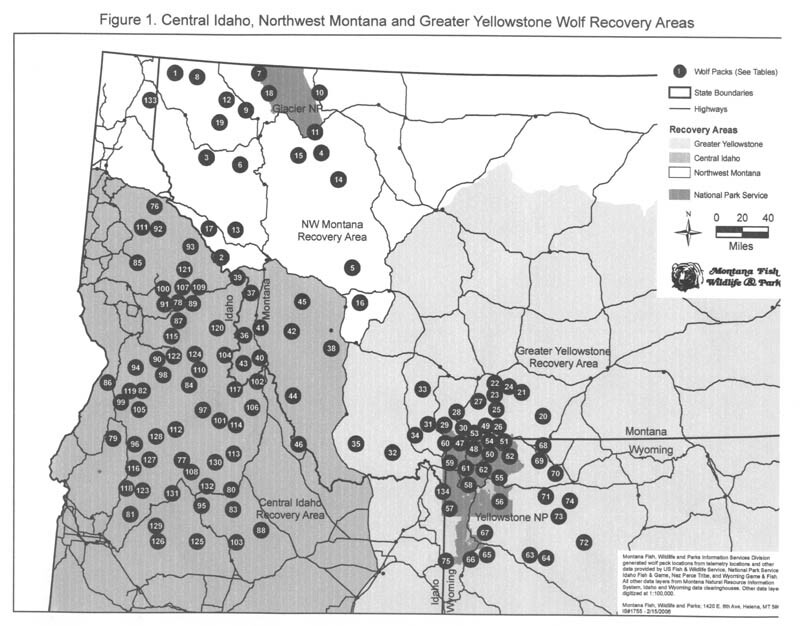 At the end of 2007 there were 171 wolves that lived primarily inside Yellowstone Park, but very high pup mortality due to disease (distemper) along with the natural attrition of adult and sub-adult wolves caused a 27% decline (124 wolves). Disease had hit the pups two other years since wolves beginning in 1995 were restored to Yellowstone. In each case, pups and the population rebounded the next year. Not so in 2009. Once again pup mortality is very high. The Druid Pack lost all 8 of its pups, for example. There is one important pup mortality difference from 2008. This year the poor pup survival does not appear to be due to a distemper outbreak or other obvious disease. Mortality of adult wolves is increasing from the mange infestation that seeped into the Park. Mollies Pack was the first pack known to have become infested, although Park border packs in Montana in eastward in Wyoming have suffered from the debilitating mite for years now. Doug Smith, Park wolf team leader, told me that Mollies still has mange, but is showing some improvment. Perhaps the most infested pack is the famous Druids. On the northern range, the Mt. Everts Pack also struggles with mange, but the Blacktail Pack, Agate Pack, and Quadrant Packs are mange free. It is expected that at the end of the year there will probably be 6 “breeding pairs” of wolves in the Park (the same as 2008). For the first time there are more Park packs living south of famous Northern Range. Packs inhabit all corners of the Park, although the Bechler Pack in Park’s southwest corner lost its only radio collar when its big white founding male finally died this summer. He originally migrated from the Northern Range all the way down. He was born to the once famous Rose Creek Pack, which was slowly driven northward out of the Park by other packs to eventually disappear as a discrete entity. The decline of Park wolves has management implications for Idaho, Montana and Wyoming. Wolf managers in the states are generally quick to say,”Oh, studies show you can manage for 30% wolf mortality a year” (note that unlike with other animals, the word “manage” when used by state wolf managers always means to kill). Even some non-affiliated biologists say 30% wolf mortality a year and a stable population go together. Data from Yellowstone Park shows this generalization has one big exception, and it would be wise to expect that more will happen on other places. In other news, wolves have been visible inside Grand Teton National Park, with the Antelope Pack being particularly out in the open where visitors can watch them. You can only generalize data from the park to non-park populations. Yellowstone had an over abundance of prey which caused an over abuncance of predators. Now that elk numbers are getting down to the carrying capacity of the land the wolf numbers will drop off to reflect that balance. I would like to know where in Idaho or Montana outside of National Parks you can find elk herds at 10 times carrying capacity. I doubt you are going to see a natural reduction in wolf numbers any where else in the rockies like what is occuring in Yellowstone. Now that wolves are being hunted it is even less likely. Ralph – thank you for that update. Is there any truth to the rumor there’s a possibility the wolf team would treat these wolves (i.e. for distemper, mange or whatever) surreptitiously? The argument could be made that they have already interfered with them by using the tracking collars so what would be the difference if they vaccinated them. There were wolves visible west of the HWY south of Triangle X in GTNP this morning. 7 blacks pretty close to the road. I’m not sure what pack this is. Is is probably the Antelope Pack. Once a canid is infected with mange it cannot be treated with a one time dose, so any wolf with mange would need to be caught, handled and medicated with ivermectin 2-3 times. Putting out medicated meatballs or any such bait is unlikely to be effective either given the abundance of other animals that would eat it and the risk of overmedicating individuals. If the wolf team decided to interfere then uninfected wolves caught for radio-collaring could be given preventative medicine, but that would obviously leave any wolf that was not caught vulnerable. I think there is zero chance of any of this happening. The park has set and kept the precedent of not intefering with what they determine to be the natural cycle of things including, according to what a park ungulate biologist told me, refusing to treat bighorns for an infectious eye disease that had infected sheep falling down cliffs because they couldn’t see. Eventually, some developed an immunity and survived. No. Mange was introduced by Montana in the early 20th century as primitive biological warfare attempt to wipe out wolves. Coyotes in Montana and Wyoming have harbored manage ever since. When wolves left the Park it wasn’t long until some wolf packs outside the Park picked it up. Where can I find information on this introduced Mange?? fantastic information Ralph I am doing a final paper on policies regarding the wolf for Donna Lybeckers class. Was Mange present in wild populations in the west before this introduction? Mange has also been present in Wood River Valley fox and coyote populations for the last few years. I’ve seen far fewer of these animals since 07, and the ones I do see are mangy more often than not. I think there was an article about this in the local paper a few weeks ago. I don’t know about the presence of mange in Central Idaho wolves. I understand mange in not a disease native to North America. I’m not 100% sure, however. That is bad news. I thought maybe Idaho was mange-free. We have mange back here in the east (MA) and red foxes (especially) and coywolves get it. I have had to treat a few radio-collared coywolves and it does take 2-3 treatments to cure it, altho in my study site (urbanized) it could potentially be done more effectively with bait altho I haven’t really tried that yet. Vaccinating is not productive management tool in this case. Disease is a tool to naturally reduce population numbers. Its not like with the bison who are restricted in there movement by a disease introduced by man. It is tough to look at animals with manage and not feel sorry for them but it is just nature running is course. You are right about one of the functions of disease, and nothing can be done about mange. However, like brucellosis, West Nile virus, and other, it is not a native disease. At this point in time, does it really matter if it is a native disease? Its here, its prevalent and there needs to be some type of solution, studying Brucellosis was one of my specialties when I graduated…and even though not native, that does not change the facts.. It is almost to the point where native isn’t relavent anymore. Disease like noxious weeds and so many other biologics move more freely throughout the world thanks to the growth of the human population and our ability to move so freely over long distance. We can keep fighting them but anymore it is just a losing battle and the world is just going to have to adapt to the change or die off. It is very relevant. Nature will adapt, but we might be the ones that dies off. I don’t buy that, humans are just as much part of nature as any other life form, we may reduce our populations, but I don’t think we will be the ones that die off..
Actually, I think that if we “over-adaptive” humans don’t find ways to alter our over populating and over-polluting ways, we may well be the ones to die off. And that may be only after we have killed off most or all other life-forms that support our survival. Perhaps we should stop over-using the “save the planet” rhetoric and start thinking and acting in favor of the biosphere, that biological area of the planet that supports our existence and includes all other life-forms and their habitat. We’ve already proven that we can overcome drawbacks from most detrimental effects of hostile environment… for a time. I suspect that time period is coming to an end for humans and at their own making. How can we expect to save ourselves if we kill everything else in our habitat that nourishes and sustains us? I know some other scientists post here regularly. I hope you will join me in supporting CBD’s opposition to Bush-era limitations on the Endangered Species Act. I agee with you. We don’t treat our fellow travelers very well on this spaceship earth. If we don’t eat them, we study them to death. When it comes to infectious diseases, native vs. non-native matters…It’s called host-parasite co-evolution. It takes thousands of years of evolutionary time for vertebrate hosts and their parasites to co-evolve with one another, reach an equilibrium of sorts. Examples? Well how about this…The introduction of infectious diseases brought by Europeans to the Americas killed an order of magnitude more Indigenous people than warfare. Smallpox alone was documented to have wiped out nearly entire villages and communities. Indigenous people of the Americas had no previous exposure to these diseases, and were highly susceptible. Thus, the pathogens were able to take advantage of lack of host immunity and exhibit greater virulence in these new hosts. Our indigenous wildlife is no different…The wolves are likely more susceptible to domestic canine diseases because they have not had long enough to co-evolve with these introduced parasites. Therefore, these diseases can act with greater virulence. Another example, is malignant catarrhal fever (MCF) and bison. MCF is a virus carried by domestic sheep and can be transmitted via wind from as far as a mile away. In a sheep-caused MCF outbreak that occurred at a feedlot located in Southern Idaho in 2003, the bison there suffered a 51% mortality rate (Li et al. 2006). However, only a single mortality occurred among 1700 cattle in the same feedlot. This is because cattle and sheep have co-evolved with this virus over thousands of years of domestication with each other. I urge folks to sign the letter in the link JB provided above. We have explained the harm the Bush interpretation of the term “significant portion of its range” has had on the ESA. Now it is time for Obama to change it. About treating mange: all I can contribute is that I rescued a Siberian Husky with a case of sarcoptic mange. One dose of ivermectin and a pill to relieve itching was all it took. Admittedly, it was not a severe case. Ralph thanks for the very detailed update, however sad. I wish the park would treat the mange, it’s not as if they’re hands off, they collar and study wolves. I hate to see them suffering like this. How sad the Druids lost all their pups. I knew there was a large decline in 2008 and here comes the decline again in 2009. Wolves just aren’t as adaptable as coyotes and some other species. They’re very sensitive to variables in their environment. It seems more bad news for wolves on every front, they need our support more then ever. Wolves are quite adaptable, but coyotes have them beat. Today’s coyote and coywolf are the product of over a century of rapid evolution induced by extreme, human-caused mortality pressure. It’s same thing you see with antibiotics. Wolves are too big, and the government is not allowing a large enough recovery. I’m afraid they will always just be a token of the past in the lower 48 states. I posted an article earlier showing the effects of human mass killing (I’m not talking about hunting here) is to cause animals to become smaller and more fertile in one way or another. I have a question. If the park refuses to help the wolves bc they refuse to interfere – meanwhile, sarcoptic mange was introduced by humans as a means of wiping out the wolves that the park is supposed to protect – how does this make sense? Also, aren’t park officials worried about the FACT that sarcoptic mange is caused by a mite that can infect people – thus, can infect the very people who visit the park to see the wolves – and their money goes to help the park and all the creatures within? If this is a man-introduced disease, then there is no excuse for the park not to get involved. Here’s a thought…tranq the wolves, medicate them with injection and pill and scrub, radio collar those that needed medication, and release them. Follow them and see if it helps. If not, repeat the process. This is a disease introduced by man and thus should be removed from these animals by man. If not, we are going to see the very imbalance in the park that we saw before the fight for wolf reintroduction was won. I’m sure there are plenty of vets and vet techs who would be honored to volunteer in this effort.